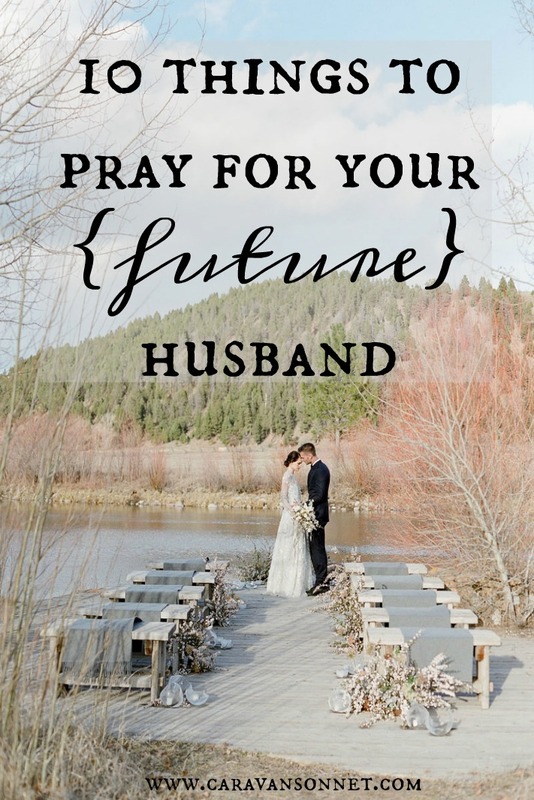 I have mentioned many times here on the blog that I pray for my future husband on a regular basis. I try to spend time each day praying for him. I started this practice years and years ago because even though I don't know who my future husband is or when we will marry I do know that when I am married I will want prayer to be a regular part of my life with my husband and for my husband so I have tried to develop this area of my prayer life as a single gal. One of the things things I have been asked is exactly what I pray for my future husband so I wanted to share today just a few of the things that I pray for him (in no particular order). If you are married I highly encourage you to pray for your husband and if you are single or engaged, I encourage you to start praying for your future husband starting now! (Ten) I pray that the Lord would bless him with amazing godly friends. I pray that he will also have good relationships with everyone that is in his life. Are there any specific prayers that you pray for your future spouse about? I would love to hear what things you pray for! Please share with us in the comments! This is SUCH an amazing thing to be doing and will build such a powerful heart of prayer in you as you prepare to be a wife. I kept a journal and wrote prayers for my future husband. I gave this journal to my husband on our wedding day...it was such a sweet thing to share together! Hi Rebecca! I love this post. May the Lord grant you the desires of your heart. I will be adopting this practice. Thank you so much for stopping by and for your sweet and encouraging comment! Unfortunately I couldn't email you directly because you are a "no-reply blogger" but I had to tell you that I really appreciated your comment! :) May the Lord grant you encouragement and joy as you adopt this practice! :) Have a lovely day! I always prayed for my future husband and I truly feel like my prayers were answered. My husband and I have been so blessed. This is an incredible post and I love how you broke each thing down.